Washington voters rejected a ballot measure to tax carbon dioxide emissions. The carbon tax battle was the most expensive in state history with $45 million in spending. This is the second time Washington residents rejected a carbon tax ballot measure. Washington voters rejected a ballot measure backed by a vast coalition of liberal groups to tax carbon dioxide emissions from in-state fossil fuel combustion. The measure, called Initiative 1631, is the third attempt to impose a carbon tax in Washington state. Voters rejected a similar ballot measure in 2016, and carbon tax legislation failed earlier in 2018. Had the measure passed, Washington would have become the first state to tax carbon dioxide emissions. The political battle over the tax became the most expensive in state history for a ballot measure — drawing $45 million in spending. Initiative 1631 was put forward by the Alliance for Jobs and Clean Energy, a coalition of environmentalists, businesses and other liberal groups. The measure called for taxing emissions at $15 a ton in 2020, which will increase at $2 a year above the rate of inflation until the state meets its emissions goals. Most of the projected tax revenue raised would have gone toward green energy projects, with smaller amounts going toward protecting forests and blunting the effects of higher energy prices on poor families. Backers said the tax would create jobs and cut pollution. “[W]hen it comes to children’s health, it has made something very clear, and that is the state of Washington needs to pass this clean air initiative, so these children can breathe clean air,” Democratic Washington Gov. Jay Inslee, who backed Initiative 1631, said in August. Carbon tax supporters pumped over $15 million into their campaign, including $1 million each from Microsoft co-founder Bill Gates and former New York City Mayor Michael Bloomberg. The Nature Conservancy and League of Conservation Voters were the two largest donors backing Initiative 1631, spending more than $3.3 million and $1.4 million, respectively, according to Ballotpedia. However, carbon tax opponents spent over $30 million opposing Initiative 1631. The largest donors against the initiative were BP and Phillips 66, spending more than $20 million collectively, Ballotpedia reported. 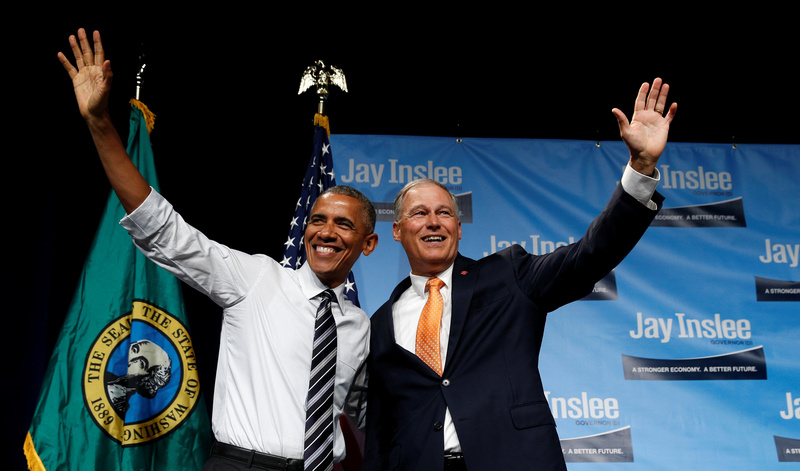 Opposition to Washington’s carbon tax was led by the oil and gas industry, businesses and conservatives who saw the ballot measure as a tax increase that would do virtually nothing to affect global warming. Opponents also noted the long list of exemptions from the carbon tax, including jet fuel, fuels used in agriculture and energy exports. 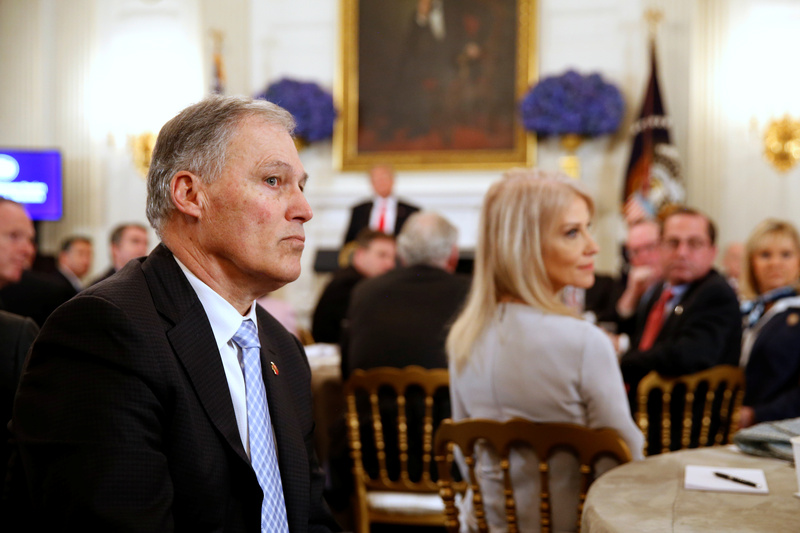 Washington State Governor Jay Inslee (L) listens to participants as U.S. President Donald Trump holds a discussion about school shootings with state governors from around the country at the White House in Washington, U.S. February 26, 2018. REUTERS/Jonathan Ernst. The tax could cost households and extra $230 per year in 2020, according to the free market Washington Policy Center (WPC). Energy bills, including gasoline prices, will increase because of the tax. WPC’s Todd Myers also warned the ballot measure would have put “spending in hands of politicians and lobbyists” that would hand out taxpayer dollars to politically connected groups. Many of the groups that supported the carbon were promised special kickbacks, according to Myers. And how much impact would Washington’s carbon tax have had on projected global warming? Well, if the entire state of Washington stopped emitting greenhouse gases, only 2/1000th of a degree Celsius of projected warming would be avert — assuming climate models are correct.